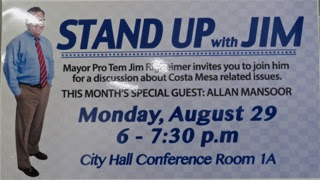 Monday night Costa Mesa Mayor Pro Tem Jim Righeimer, who owes his presence on the City Council to former councilman Allan Mansoor who appointed him to the Planning Commission a few short months after he moved to town to give him a leg up on the competition, hosted a "Stand Up With Jim" evening in Conference Room 1A at City Hall at which Mansoor - a candidate for City Council in November - was a "Special Guest". It was payback time. A funny sidebar... I arrived at City Hall at exactly the same time Mansoor and his lovely little family arrived. I went directly to the conference room through the front door but, for some reason, Mansoor walked his little brood all the way around the building and entered in the back door of City Hall. Could it be that he got lost? Anyhow, the wife and kids hung out in the lobby except when checking in from time to time, as in this image. Anyhow, on with the show. Fewer than 30 people - many of whom are avid Righeimer supporters - showed up for this non-political, political stunt. There were many familiar faces - some of whom you'll recognize in these images. As is his style, Righeimer controlled the conversation and, occasionally, remembered that Mansoor was in the room and threw him a bone to answer. He opened by introducing Mansoor, who then gave a little history of his involvement in The City, including his previous 8 years on the council. 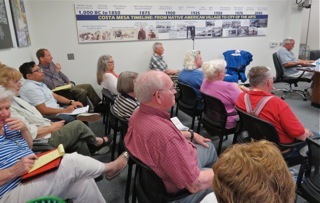 One of the first subjects discussed public safety - specifically police staffing and crime. Mansoor, a former Orange County Deputy Sheriff, told us that it takes a long time to find, hire and train a good officer and praised Chief Rob Sharpnack for not reducing his standards to speed up the process. There was a discussion of Prop. 57, the latest scheme by Governor Jerry Brown to unleash more criminals on our streets, following in the wake of Prop. 47 and AB 109. At one point Mansoor told the audience that simply hiring more cops wouldn't necessarily result in less crime. He told us that we needed to "adjust our expectations". That got everyone's attention, particularly when one speaker asked if he meant we shouldn't hire more cops. He backpeddled a little, and referred to the above-mentioned pieces of legislation that turned criminals loose and changed some crimes from felonies to misdemeanors. Some of those crooks don't even get sent to jail. Mansoor said they just laugh in our faces. Righeimer addressed those criminals on our streets and said, "They gotta eat", so they will commit petty crimes - auto burglaries, etc. - knowing that they won't go to jail. Homeless was another issue discussed at length. Righeimer said we've never really pulled out of the recession and blamed our homelessness situation on "attractants". And, the problem is exacerbated by the proliferation of sober living homes in the city, some failed residents of which end up as homeless sometime criminals on our streets. Group Homes - sober living facilities - got a lot of discussion. Righeimer explained some of the financial facts - very expensive drug tests, for example - that are paid for by insurance - ObamaCare. Mansoor said there is no willingness to address the problem in Sacramento. The lobby for this business is too strong. 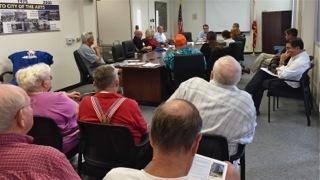 Our two ordinances were discussed, as was the pending avalanche of request for Special Use Permits for existing units, asking for "reasonable accommodation". The Solid Landings settlement was discussed, but Righeimer didn't acknowledge what activists have found out - that some of those homes have simply become occupied by other sober living entities. Resident Barrie Fisher spoke of her neighborhood, which has several sober living homes adjacent to each other. When asked by another resident about strategy to manage this issue, there was no real answer. Resident Margaret Mooney spoke up and complained that not enough was being done about homelessness. Righeimer asked her what she wants to do, to which she replied we need permanent suppportive housing. 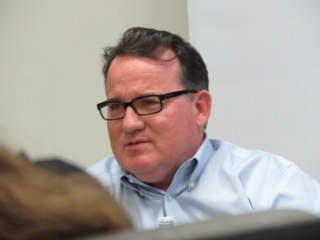 Righeimer brought up his red herring $20 million bond issue that was rejected. Mansoor said we are willing to do our part, but that other cities should be encouraged to do their part. 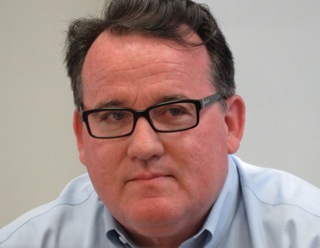 He had no specifics about just how you incentivize other cities to take on some of the burden of homeless. 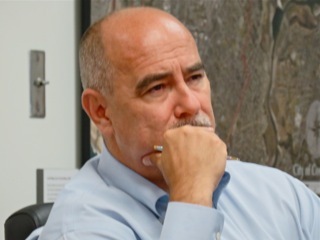 Righeimer reprised his old refrain about being on the OC Housing Commission for more than 12 years and that it's a tough problem because of all the attractants.. 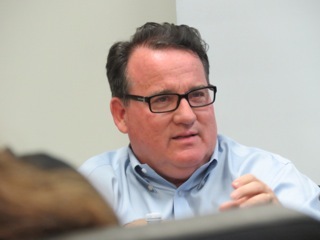 He suggested transitional housing, but Mooney told him HUD is not funding transitional housing. He rejected the "voucher for life" solution. I asked Mansoor if, during his tour in Sacramento, he saw any indication that the State is interested in solving what is clearly not just a local problem. He said no - that state government is broken. Ron Amburgey wondered to Mansoor if we still had a problem with illegal immigrants because that was his big cause when he was on the council. Mansoor said we took more than 1300 criminals off our streets during his tour - clearly a softball tossed to him by a friend. A resident wondered about the continuing costs of the Benito Acosta affair - which she supposed was over $800,000 at this time. 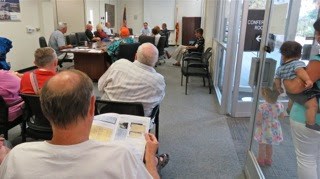 The meeting ended promptly at 7:30 after 90 minutes of spirited discussion - most of it by Righeimer. It was clear that Mansoor didn't have many answers - not surprising. Tonight councilwomen Katrina Foley and Sandra Genis will hold a similar meeting in the same venue at the same time - 6:00 p.m.
WOW! Jami Jo Nutball and her folks....Amburgey...Chuck Perry...were they serving all you can eat pizza or something? I don't understand the poster. Everyone, including Jim, is sitting down. Bwahahaha! You're right. The only ones standing were Mansoor's wife and kids.